If you click on it to see the full size image, you'll see the challenge. 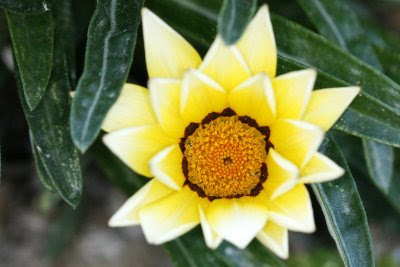 The center of the flower is very sharp, as was the goal of the shot. However, the petals are very blurry. If I'd wanted the petals to also be sharp, I'd need to stop down significantly - to the point of either not having adequate light to make the exposure, or requiring a higher ISO and thus grainy photo. Of course, I could/should use a tripod, but even then, at f/18 or higher you start to lose sharpness due to dispersion, so I'd need to add some extra light. 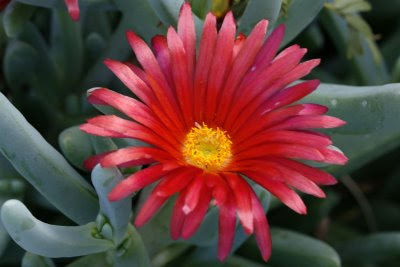 The iceplant flower (about 1" across in real life) below is another good example. I missed the focus just a little, and the result is the entire flower appears out of focus. Generally, the goal is to get the stamens and pistils in sharp focus since that is where the eye normally is drawn, and where the most contrast exists. But in this case I focused midway on the petal. The result: the center of the flower is out of focus, and the edge is out of focus. The best thing to do is spend extra time with macros and use a tripod and add extra light. Reflectors help add natural light and fill shadows. I also use a macro ring flash on occasion, but it can cast an unnatural light on indoor macros (but it works great to fill shadows outside). And this is all the more important when you add extension tubes and attempt super-macro shots.